A couple of days ago, our family celebrated Father’s Day a little early. Mark’s schedule is always a bit crazy and last week was no exception. We didn’t really do anything too out of the ordinary for most of the day. Just hung out and played together around the house. Many games of Hide-and-Go Seek were played, lots of Chase, and tons of rolling Lightning McQueen across the floor. Back and forth. Townsend is a bit obsessed with the latter right now. Hide and Seek plays out interestingly in our house. When Cannon is the counter, he counts while chasing after you to your hiding spot. But if you force him to wait till he gets to 10 before looking for the hiders, and he can’t find them immediately……he gets scared and cries hard. He shouts, “Dad, Dad, Where are you, Dad? 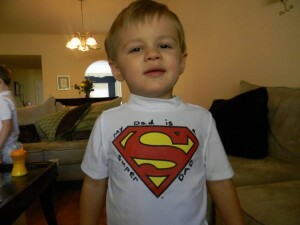 Cannon is worried.” So, you have to help him work through it and systematically look through all the rooms of the house. This exercise in patience and being thorough is quite difficult for Cannon and usually results in a meltdown. If he is the hider, he generally hides in the same couple of places. Even if you put him in a new place, he will run to an old one. If you hold him in a new one, he screams. And he refuses to understand that you aren’t just running aimlessly in circles when you play chase. I tag him and let him tag me at times but he hasn’t picked up on it yet. But he has fun for the most part and we have faith that one day he will understand playing these games if we just keep practicing. After Mark and Townsend took a nap……I changed Cannon and Townsend into their special t-shirts. 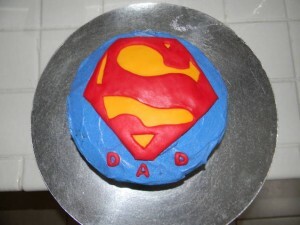 Our theme for Father’s Day this year was “Super Dad.” Did I mention I like themes? Well, I love them actually and can’t get enough. I sought out and purchased Superman t-shirt’s and then altered them with fabric paint. I also got a hat and altered that for Mark. Have a look…. 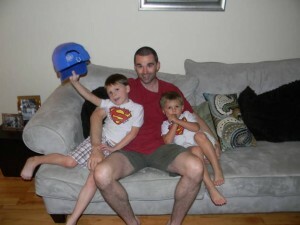 The boys also ran around the house all afternoon yelling “Super DAD!” It was super cute! I tried desperately to get a pic of the boys together in their t’s but there was no cooperation from Cannon. He would just scream and say “Is everybody taking a picture” over and over. He heard this somewhere. It is a script he repeats in this situation. It was a big bummer after the work I put in but that is life with Cannon and there are worse things. When dinnertime rolled around, I made what Mark requested……Inside Out Bacon Cheeseburgers, Homemade Steak Fries, and a Green Salad. Cannon had an organic beef burger that I made special, some unseasoned potato wedges, and plain organic greens with a little lemon juice. As soon as the last bite was in his mouth, and before he had even begun to chew it, Cannon was asking for cake. They had seen me working on a special cake throughout the day and were VERY excited about it! So, I presented it to my sweet husband. He laughed and said he liked it! Here’s a peek……. Baking and decorating cakes is another method of therapy for me…….along with cooking in general. It relaxes me, allows me to be creative, and makes me feel good. I need it! I crave it! I am very average at it when it comes to the cake decorating shows I like to watch on t.v., but I could care less. Before cutting the cake, I took it back into the kitchen so I could pull the switch. I grabbed a GFCF cupcake from my freezer stash and reheated it. This was for Cannon and he got his first. Then, I served everyone else the Super Dad cake. Cannon was so busy consuming his cupcake that he didn’t realize everyone else had something different. And when he was done, he just wanted to get down and play. He didn’t even notice! Thank goodness! On a day when we honored fathers, I must take the opportunity to mention mine. Oh, where do I begin?! Right. (Here come the tears.) My dad is an incredible man! And I am totally a Daddy’s Girl! Many people know my dad for his mission work. He heads up an organization that has orphanages, churches, schools, seminaries, and medical facilities all over the world (www.mustardseed.org). They know him as the man who is in church every time the doors are open, sits in the same spot every week, and has been volunteering in the baby nursery at that church almost every Sunday since my 22 year old sister was a baby. They know him as the former businessman, joker, the incredibly faithful friend, ……… A man who works hard on his yard and garden calling it his therapy. The man who, on his morning bike ride, rides by and puts the newspapers of his friends on their porches. But I know him as the man who began taking me running with him when I was 6 years old every day when he got home from work. It made me feel so special. I know him as the man who never missed a piano recital, play, or basketball game. The man who took me on Date Nights about once a month and then dared to take me shopping. The man who got a key to my high school gym and took me there on Sunday afternoons. To rebound for me so I could shoot around. The man who taught me lessons like the difference between right and wrong, how to put God first in my life, give cheerfully, do good to do good and not care who gets the credit, and trust God with all my heart even when life gets tough. He always practiced what he preached, too. What more could a girl ask for? I am honored to be his daughter. Finally, there is my husband. VERY early in our relationship I took him with me to babysit for some kiddos whose parents were in a Bible Study. The boys wanted to play outside and the girls inside. Mark volunteered to stay inside with the girls. When I came in to check on them later, I found him dressed up and playing tea party. It was then that I thought…….I might really have something here. 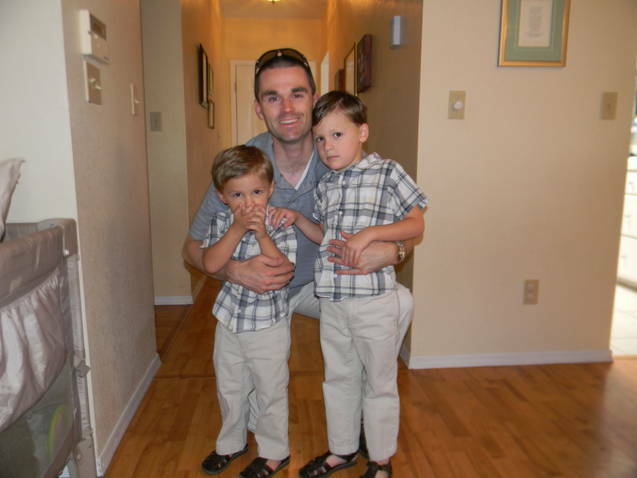 My husband is gentle, he is kind, he is loving, he is a fantastic playmate for our children! He is creative, he is funny, he is silly, he is their buddy. 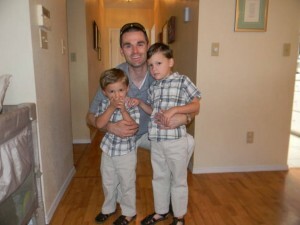 My boys live for when Daddy is home! The other day when Mark was leaving for work, Townsend said, “This is just terrible!” I am so proud to call my husband my husband. 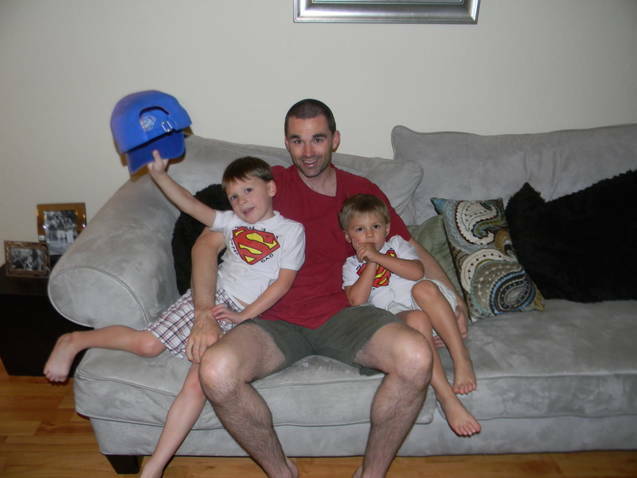 But I am even more proud when I watch him with our boys. I love you honey! On this particular journey, Mothers get a lot of praise. The title “Mother Warriors.” And can appear to do a majority of the work when it comes to the therapies and appointments. But there is no way on this Earth, I could do this without my husband. And my dad. Their support keeps me going and helps me to fight harder and longer. I was recently talking to my dad about some breakthroughs with Cannon. He immediately began asking me exactly what we were doing differently, wanted explanations of new meds and treatments, and suggested I write it all down and call our doctors to tell them. See what I mean? And my husband does awesome things like taking Cannon to OT and PT every week so I can have one on one time with Townsend. Doing the grocery shopping. And goes to work 5 long days a week to support our family. Where would I be without my Dad and husband? I don’t know and I don’t want to. They definitely deserve the title “Father Warriors.” And so much more! I hope every Dad reading this had a wonderful, special Father’s Day! OK…who is going to wipe my keyboard dry?!?!?! God doesn’t give us more than we can handle…boy do you have your hands FULL!!! Luv u all!! !